These distinctions and tensions are also evident in the entry arrangements at the conference site, with government delegates, UN staff and other categories of accreditation having the highest status and fast track entry to the registration and security clearance areas, while ordinary ‘participants’ have had to stand in interminable queues, often in hot sunshine, for literally hours. 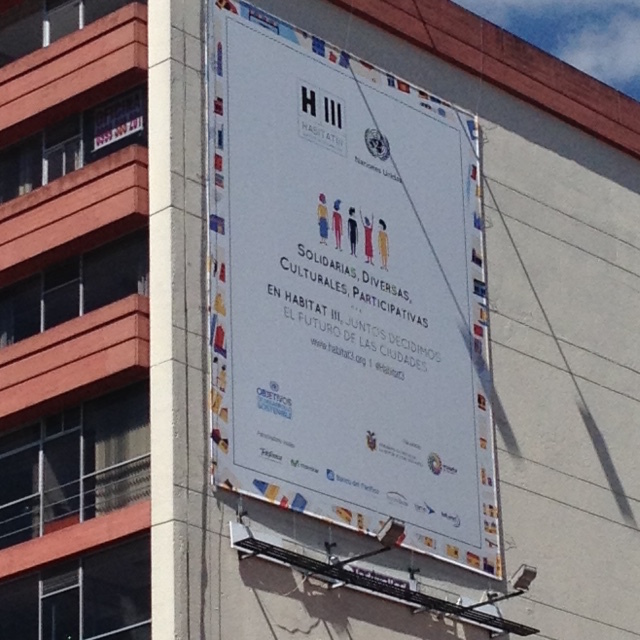 While what is by far the largest such event ever held in the Ecuadorian capital is inevitably creating bottlenecks, at the single entry and badge issuing locations, the continued delays – meaning that many people have been missing or arriving late for their sessions – has by Tuesday morning led to the event being dubbed Queueto by some frustrated participants. By Wednesday, additional scanners had been installed – but since the number of registered participants was known in advance, the inadequacy of arrangements was baffling. The problem has been exacerbated by the summit being split into two adjacent sites, requiring separate security entry procedures each time one moves between the two. The official programme and selected networking and side events are in the main Casa del Cultura, while the rest take place in the Exhibition area. Although they could readily have been integrated into a single campus, the latter site is open to the public in an effort to make the event accessible to ordinary citizens, hence necessitating separate screening. Preparations for the summit, especially in relation to the approval and scheduling of networking and side events, had also been chaotic, leading to a frantic last-minute scramble for alternative venues and travel arrangements. A plenary session of the World Mayors’ Forum on Sunday afternoon, hosted by the dynamic mayor of Quito, preceded the main summit. This slightly curious formula constituted the UN’s accommodation to the implications of the NUA, namely granting a formal platform to local government leaders, while maintaining the summit itself as the creature of national governments. That said, Ban ki Moon, the outgoing UN Secretary-General was on message, whereas, his engaging personality notwithstanding, Joan Clos, UN-Habitat Executive Director and a former mayor of Barcelona, somewhat misjudged the balancing act. While noting the importance of the summit, he pointing out that, as the signatories, national governments held the ultimate responsibility for the NUA and its implementation. He must have been shifting in his seat as one after the other, the dynamic current mayor of Barcelona, followed by her counterparts from Dakar and Montreal, hailed the importance of the NUA and asserted confidently in Spanish, French and English that cities are in the frontline of the struggle against climate change and other challenges, as well as action and implementation. Since Monday, while government delegates have been preoccupied by the usual summitry, and starting to focus on how to move forward, not least with fundraising for implementation, other participants have been offered a plethora of competing presentations of every sort. Lectures, GIS and urban database presentations, panel discussions, exhibits and book launches on both sites have jostled for attention. Local authority representatives and the leadership of the main umbrella bodies, ICLEI (Local Governments for Sustainability) and UCLG (United Cities and Local Governments) and the World Compact of Mayors, were upbeat following the success of the local government summit in Bogotá last week, where, after years of rivalry, they agreed to work together around the NUA and implementation of the urban Sustainable Development Goal (SDG11). UCLG’s GOLD4 report, launched at both summits, deserves serious attention in this context. My own agenda has also been packed, with committee planning meetings, discussions about potential future research and conference collaborations and catching up with colleagues from around the world fitted around speaking commitments. On behalf of Mistra Urban Futures, I launched our two new Open Access books, Rethinking Sustainable Cities: Accessible, green and fair and Co-production in Action: Towards realising just cities in a packed Side Event shared with the Urban Climate Change Research Network’s Second Assessment Report on Cities and Climate Change, to which I am a contributor. In a separate book pre-launch at the pavilion of the International Council for Science (ICSU) and Future Earth, I spoke as a section co-editor of the forthcoming Future Earth volume, Urban Planet. 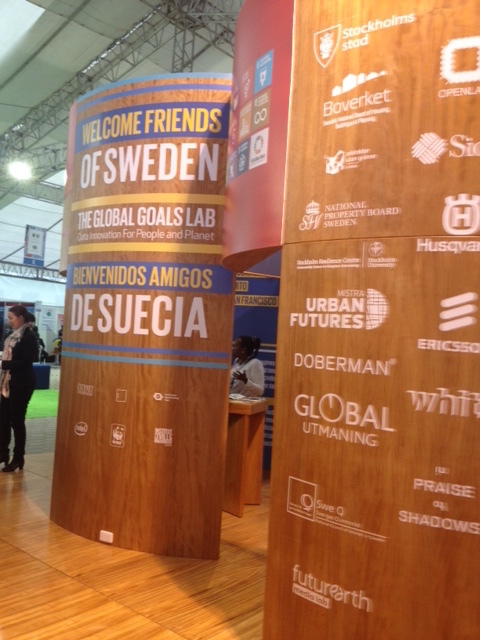 At the Swedish Pavilion, a joint event organised by Mistra Urban Futures with WWF Sweden (organiser of the annual Earth Hour City Challenge, on the international jury of which I served this year) and Global Utmaning, a Swedish thinktank, reported on our collaborations around urban sustainability, climate change adaptation and leadership for the SDGs and NUA. Part of my contribution focused on our experience using co-production methodologies, a topic that also arose in panel discussions on urban resilience and change for Future Earth, and on the work of the Urbanisation and Global Environmental Change programme over its ten-year life, now concluding. The only commodity in short supply has been sleep! David Simon is Professor of Development Geography at RHUL and Director of Mistra Urban Futures.